I have been on the hunt for the perfect Black & White cookie for a couple of years now. I have come across a couple pretty good ones, but nothing yet has made me want to get into my car in the middle of the night and drive 3,000 miles for a cookie. EuroPan is a small chain of bakery/cafés that have your standard issue baked goods in stock, and I have walked past the Broadway and 94th Street location (New York City) dozens of times and not gone in. But I needed a loaf of bread for dinner, and while choosing my bread I could not resist picking up a cookie and reviewing yet another Black & White. See the sacrifices I make for you guys? Eating cookies on a whim! Remember, kids, I am a committed professional -- and such acts must be only attempted with great seriousness and caution. The cookie itself is huge. You could call it the size of a large coffee saucer, or even a small salad plate. And it was a good quarter of an inch thick at the edges, maybe half an inch in the middle. The frosting is separated fifty-fifty. Through the clear plastic wrapping, the sponge cake felt moist. This can be a good thing...provided it's because the cookie is moist, as opposed to as greasy as a cast member of Jersey Shore. (Not that I've watched every episode and the reunion special. No, not me, I haven't. Really.) It was in fact moist and spongy in a good way. The cake itself had a vaguely lemon flavor that I really liked. The white side of the frosting really just tasted like simple icing, and didn't seem to attempt to be "vanilla" -- and I think that worked to its advantage. It added sweetness but at the same time it didn't have the sometimes horrible fake vanilla aftertaste. I am sure that if done with real vanilla it would be outstanding, but it's pretty darn good ether way. The chocolate side: nice, deep cocoa flavor. Think of a somewhat solid version of a good canned chocolate frosting. It's fudgy, but never too sugary. It tastes like it was actually made with real chocolate. What I also liked about both sides of the frosting is that the layers are thick enough that you get the slightly crunchy feel of really biting down into something before you hit the soft, springy cake. Everything about this cookie was good! If there's a EuroPan anywhere near you (so far, only in New York City), you need to check this out. This has been the best Black & White to date! Ummm...I forgot. Sorry! But I'm quite sure it's under $2.50. Hi -- nice blog! I have to comment on your B&W choices because they've all been pre-packaged cookies that are pale reflections of the true New York Black and White! You've got to go to a real bakery to get a sense of the variety -- I grew up on the ones from Leske's in Brooklyn, they're about 4-5" wide, are covered with soft icing, are baked daily, and never, ever, EVER plastic wrapped. I've had amazing hardshell ones at Dean and Deluca or Eli Zabar's E.A.T. on the UES (one of those -- I can't remember which), which would be easier to get to if you're just visiting the city for a few days (Bay Ridge is a bit of a hike). 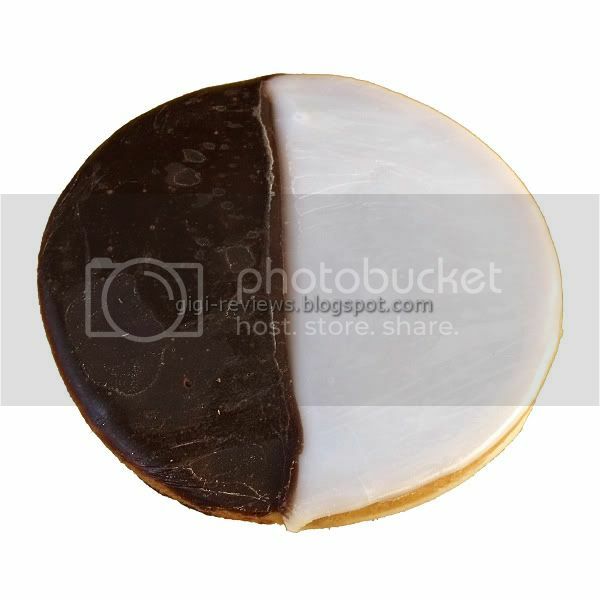 I should add, though, there's a big Brooklyn - Utica, NY rivalry, for the Black and White cookie title. The place is known for their marvelous "half moons" (as they call them up there.) The Uticans say they're the best, but I tend to think they've just taken the Brooklyn recipe upstate! 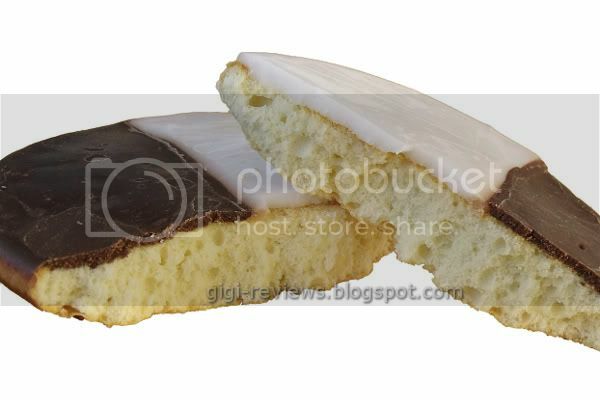 I recently had some excellent ones at a wedding up there -- like the ones from Brooklyn, the Utica cookies were covered with buttercream icing, but were smaller than the Leske's ones. Really delicious cookies! In the interest of a good review I am not adverse to having to travel to get something that could be great so I am going to have to put Leske's on my list for next visit. and anything with the name "Zabar's" before it has got to be good! Next time you come to NJ, remind me to take you to a bakery that Joe swears has the best B&Ws on earth. I even like them. 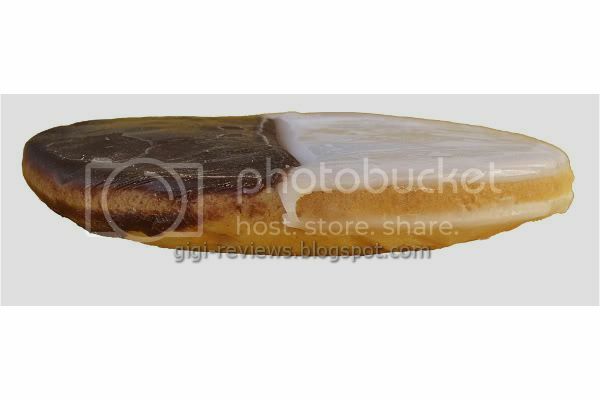 The vanilla side is creamy and yummy instead of the flakey, chalky waxlike stuff most places use. The cookie is more like a soft cake with a subtle hint of lemon. WHY AM I JUST HEARING ABOUT THIS NOW?!!! I'd recommend Glaser's on the UES for a spectacular black & white... I just recently re-reviewed it for my own blog! I sense I am going to have to do a lot of B&W tasting on my next trip! Aw thanks Gigi! I just recently stumbled across your blog and I love it.